There are so many good reasons why we've earned our fabulous nickname (“The Garden State”). New Jersey bursts with beauty, in glorious venues that cultivate smiles and inspiration throughout the year. Be sure to download and print these ten flower-filled picks, which draw bud lovers like you from miles around. Stop and smell the roses—lots of them! 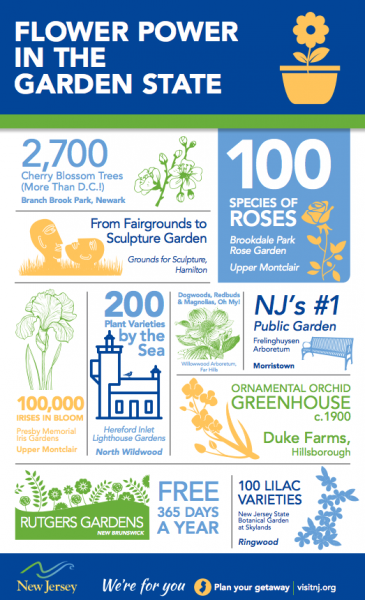 Since 1959, the elegant Brookdale Park Rose Garden in Upper Montclair has grown to 1,500 rose bushes of around 100 varieties. Discover this serene oasis, divvied up into 29 separate beds of hybrid tea, floribunda, shrub, hybrid musk, polyantha, rugosa and antique roses. New Brunswick's Rutgers Gardens boast beautiful horticultural collections that include All-America Selections flower and vegetable winners, plus one of the country's largest American holly collections. Explore a bamboo forest and spots dedicated to shade, ornamental and evergreen trees, rhododendrons and azaleas, shrubs and more. Specimens are always in bloom, and you're invited to check them out any day you like, free of charge. Locals lovingly refer to historic Presby Memorial Iris Gardens in Upper Montclair as the "rainbow on the hill." With over 10,000 irises of about 1,500 varieties, they pop with more than 100,000 blooms throughout May. Stroll the biggest public iris garden in the U.S., a living museum of botanical preservation where every bed is marked with helpful identification plaques. Did you know? At the annual Essex County Cherry Blossom Festival in Newark's Branch Brook Park, you can celebrate the nation's largest cherry blossom collection in full bloom. Alongside pink and white on parade, expect a family-friendly lineup of fun events. Local history and horticulture combine at the award-winning, 127-acre Frelinghuysen Arboretum of Morristown. There, you can admire lush woodlands, meadows and gardens, plus impressive tree and shrub collections, all surrounding a picture-perfect Colonial Revival mansion. In Hillsborough, a highlight of 2,740-acre Duke Farms remains the turn-of-the-last-century Orchid Range. Once used to yield flowers for the New York market, today this lovely location houses 1,500 orchids in its Subtropical Display and Tropical Display, as well as outdoor plantings native to New Jersey. The exquisite New Jersey State Botanical Garden at Skylands in Ringwood features an incredible collection of lilacs. Catch this sensation in May, at peak bloom. But with 96 total acres of specialty gardens, hugged by 1,000 wooded acres, you can wander miles of paths year-round, to see splendid horticultural species from around the globe. The renowned, Victorian-style Hereford Inlet Lighthouse Gardens in North Wildwood shine with hundreds of varieties in different alfresco "rooms." Wind your way along paths that link them, right up to the seawall and Atlantic Ocean. Pause on benches in quiet niches, and watch for fluttering birds and butterflies, too! Hamilton's Grounds for Sculpture, set on the former New Jersey State Fairgrounds, now showcases an eclectic experience integrated into its historic buildings and beyond. Explore an ever-evolving sculpture collection, spread across 42 superbly landscaped acres—and unearth surprises around every corner. Dogwoods, Redbuds & Magnolias, Oh My! Across 130 rolling acres, the Willowwood Arboretum of Far Hills abounds with around 3,500 native and exotic plants. In addition to untouched forest, gaze up at excellent, historic tree specimens—not to mention the Conservatory, Bee Meadow, the Lilac Collection, Pan's Garden and oh-so-much more! Browse our website to discover plenty more gardens and arboretums. 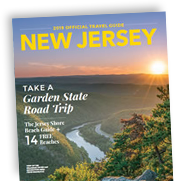 Plus, download a free NJ travel guide or sign up for e-news from New Jersey Travel and Tourism.